Sometimes a single moment can set the course for the rest of your life. For Nathan Rivard, a chance conversation with a National Guard recruiter in high school would kick off a career in public affairs that’s entering its second decade. 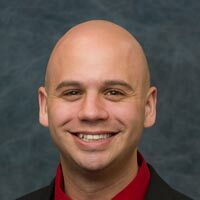 Nathan is a 2016 graduate of George Washington University’s Master of Professional Studies in Strategic Public Relations online program, and has held a number of communications roles across different branches of the U.S. armed forces. His work has included producing video broadcasts, written news stories, interviews, photographs and other public-facing media to provide a behind-the-scenes look at the people and humanitarian efforts of our armed forces. While he would go on to receive accolades for his projects, including being named the Air Force Communicator of the Year, Nathan shared that his proudest moments were when he was able to make a personal impact on the lives of those serving our country. Nathan was also able to fulfill his own goal of earning his graduate degree during his service. After researching different online programs, he chose to pursue strategic public relations with George Washington University. Since graduating in 2016, Nathan has used his experience and education to pursue his current role as public affairs deputy for the Vermont National Guard. The organization is headquartered in Colchester, VT, and comprises the state’s Army National Guard and Air National Guard. This latest opportunity has reaffirmed his long-ago decision to help provide a fresh perspective on those serving our country and allowed him to draw on the master’s education he chose to make a priority this far into a successful career.